I’m a soccer player. Since I stepped on the field, at six, I’ve identified myself this way. Every goal was directed toward soccer—the next game, playoffs, sectionals, awards, next season, college, Olympics . . . I ate, slept, and breathed soccer. It was like I didn’t know anything else. Like there was no me. They weren’t even my goals. Well, they were, but they weren’t, if you know what I mean. When my dad signed me up, they didn’t have teams for my age, so they put me on a team with kids up to ten. I don’t know why they took me; we lived in a small town, so maybe they didn’t have enough kids. I’m coordinated and I’ve always had a lot of energy, totally key. Right away, I was the best on the team. It sounds like a bigger deal than it was. The other kids were all older and bigger, so no one expected me to be better, but think about it: my dad played college football. I have good genes. I like sports. What six-year-old wants to practice all the time? Me. So it wasn’t like I had competition. I had a head start plus my father behind me, pushing me, overseeing my workouts. I should have been the best. I kept pushing myself, working out, training hard. I didn’t even know why. Because I was supposed to. My dad had all these plans. He put a lot of time into my soccer. I couldn’t let him down. My coach relied on me, my teammates depended on me. It was like the whole town wanted me to do it, to be somebody, bring glory to Cortland—so they could be somebody too. It’s easy to get lost in all that. This is a secret. Promise not to tell? Swear to God? I’d be mortified if anybody found out. It was over. I wasn’t going anywhere. There was this little kid, a runner, eleven years old. I read about her in Sports Illustrated. She won the national championship—dusted the competition. The girl lived in the mountains. For workouts, she ran hills with sandbags strapped to her shoulders. Of course her lungs were developed. Duh. The other kids never had a chance. A year later, the second place girl came in ten seconds behind her. By high school, she was only average. That would have been me. Kids were catching up. Forget the Olympics. I’d have been lucky to get any playing time in college. My glory days were over. I was only sixteen years-old, feeling like the best was already behind me. That’s the real reason I began to hate soccer. No, it’s not why I quit. But it was always at the back of my head, you know? It’s how come I was always so frustrated. The end was coming. Since I was six, I was always the best. It would have been humiliating to watch the other girls pass me. Everybody roots for the underdog, because they know what it’s like to always get beaten. You know what it’s like to only ever have been at the top? Looking over your shoulder, waiting for people to pass you? After I quit, I didn’t know what to do with myself. I could fill time. I hung out with my friends. That’s not what I mean. I mean, there was no structure. The days spread out ahead of me, with nothing to organize them. Am I making sense? I had nothing to look forward to, I guess. Suddenly I had no goal. It took a while to figure out what I wanted. I’m still not entirely sure. I want to get married someday. I know that. I want to have to kids. We’ve talked a few times, Todd and me, about marriage. I doubt it would ever work out. I mean, I love him and all, but parents can’t stand him. I don’t want to go through life like that, my parents hating my guy. They’d end up hating me. Not that I’d ever let on. I mean, really? You don’t tell your parents that stuff. You’ve got to leave them guessing. Haha. Seriously, parents don’t need to know how bad you want to please them. They’d just use it against you. We can’t kowtow. We’ve got to hang tough. That’s the only way to ever get your independence. Let’s see: I want to travel around the world, doing something fun. If I could learn to play guitar, I could totally see myself in a band. All those cool outfits, too, right? Oh my god, I can totally see it. I’ll be like the coolest rock singer ever. They want something to be proud of? Ha! Just wait! Here I come. I want to be a good mom. That’s my long-term goal. I really want to be a good mom. Who is Leah Tyler? 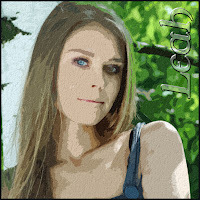 She is the main character in Terri Giuliano Long’s best-selling novel, In Leah’s Wake. Leah Tyler was an All-Star soccer player, the MVP of her high school team, and a Boston Globe All-Scholastic Player of the Year. She’s 16 years old and lives in Cortland, Massachusetts, with her parents and younger sister, Justine. Terri Giuliano Long is the bestselling author of the novel In Leah’s Wake. Her life outside of books is devoted to her family. In her free time, she enjoys walking, traveling, and listening to music. True to her Italian-American heritage, she’s an enthusiastic cook. In an alternate reality, she might be an international food writer. She lives with her family on the East Coast and teaches at Boston College. 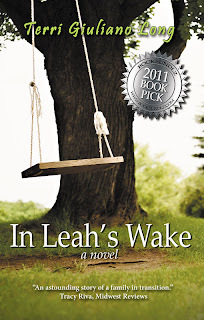 In Leah’s Wake is her debut novel.